It wouldn’t be much of a stretch to argue that Wonder Woman is the best straightforward comic book-inspired movie since Christopher Nolan was making his Batman films. (For clarification purposes, I consider Deadpool and Logan, with their more ambitious agendas, to be in a different category. Deadpool is more satirical than serious and Logan is a modern-day Greek tragedy.) While having a female director perhaps gives Wonder Woman a subtly different perspective, the real strengths of this production are its lead actors, the period piece setting, and an unexpected emotional resonance that one doesn’t expect from a popcorn movie. In comic book parlance, this is Wonder Woman’s “origin story.” Although the character was awkwardly inserted into Batman v. Superman, this outing provides context to her appearances in that film. The character is arguably the third best-known member of the DC superhero family (after Superman and Batman). Like Hulk, Wonder Woman’s profile was enhanced as a result of a 1970s Prime Time TV show and, as campy as the Lynda Carter-fronted program was, it nevertheless made Wonder Woman a household name. As a result, this movie arrives in theaters with more buzz and anticipation that it might otherwise have. The origin story has a twist. Like Captain America: The First Avenger, it skips back in time to introduce the character’s beginnings during a different era. With the exception of two short framing sequences, all the action transpires in the early part of the 1900s (with a majority in 1918). Wonder Woman is forthright in its depictions of combat, never shying away from the particular horrors of World War I. The most disturbing is a near R-rated representation of a mustard gas attack on a peaceful town. There are also scenes of trench warfare and a charge across No Man’s Land against a fortified German position. These are things I haven’t seen in any previous superhero movie and Wonder Woman deserves credit for incorporating them here. 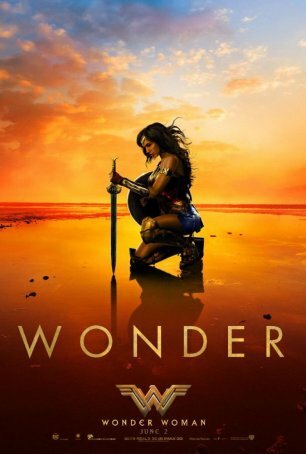 Wonder Woman’s central premise – that the main character, Diana (Gal Gadot), is the demigod daughter of the immortal Zeus and the amazon Hippolyta (Connie Nielsen) – is absurd (although no more than Marvel’s Thor) but the screenplay, credited to Allan Heinberg, develops this fantasy-flavored alternate reality in such a way that we buy into it. After some early getting-to-know-you scenes that illustrate aspects of life on the island of Themyscira, which is populated exclusively by adult warrior women, the story is propelled forward by the crash-landing of American intelligence officer Steve Trevor (Chris Pine). After speaking passionately about the evils of war, Steve inadvertently convinces Diana that she must accompany him back to “Man’s World” to find and do battle with Ares, the God of War. Only with his defeat can the human race have a chance to find peace. From there, events move to London, where Steve and Diana promote a secret mission into German territory to destroy a cache of gas weapons. They are thwarted by the diplomat Sir Patrick Morgan (David Thewlis), who believes any such covert operation would threaten the planned armistice. Behind-the-scenes, however, Sir Patrick agrees to help. Steve recruits three compatriots – Sameer (Said Taghmaoui), Charlie (Ewen Bremner), and Chief (Eugene Brave Rock) – to come along. Their goal is twofold: stop the Germans from deploying and using a new kind of mustard gas and allow Diana to confront German officer General Erich Ludendorff (Danny Huston), whom she believes to be Ares. The filmmakers have learned from the failings of their immediate predecessors when it comes to tone and style. In many ways, this feels more like a Marvel movie than a DC one (at least if one goes by the recent DC roster). The darkness inherited from Christopher Nolan remains but it’s lightened by humor and a flirtatious romantic element. There’s a charm to the Steve/Diana boat scenes and the fish-out-of-water aspect of her arrival in London. The movie takes itself seriously but not so seriously that it’s afraid to crack the occasional joke. This is the first recent DC movie to “get it right.” It also achieves the difficult goal of building its spectacle to an emotionally-charged climax (rather than one that is merely visually satisfying). The creative team wasn’t content with the “business as usual” approach of most comic book-inspired movies and it shows in the final product. One open question is whether Marvel die-hards will warm to Wonder Woman even though it’s from rival DC. The average movie-goer won’t care about the long-standing feud, but for comic book fans, loving and appreciating Marvel shouldn’t be an impediment to enjoying something from DC (and vice versa). If imitation is the sincerest form of flattery, then Marvel should be delighted by Wonder Woman, which appropriates many of its stylistic markers. (It also borrows heavily from Return of the Jedi, but that’s another, spoiler-filled discussion.) Regardless of how Marvel’s true believers react to Wonder Woman, the rest of the viewing audience can be assured that, with the release of this film, the summer of 2017 will have at least one memorable motion picture spectacle.